BATON ROUGE — 5A Catholic High School of Baton Rouge could well find itself in the state high school playoffs against 3A Parkview under a rules change approved last week by the Louisiana High School Athletic Association. The controversial decision, which was made on a vote of 209-119 by high school principals, divides football playoffs into two major categories — one for “select” schools and another for “non-select” schools. “Select” schools, which would include all private schools in the state, could only compete against each other in the playoffs. “Non-select” schools could only compete against each other. Under the LHSAA resolution, a “select” school is one which draws at least 30 percent of its students from outside the public school attendance zone where the school is located. Select schools include private and parochial schools, magnet schools, charter schools, and other schools with selective admissions. At present, public and private high schools in the state compete in five classifications, based on student enrollment — 1A, 2A, 3A, 4A, and 5A. 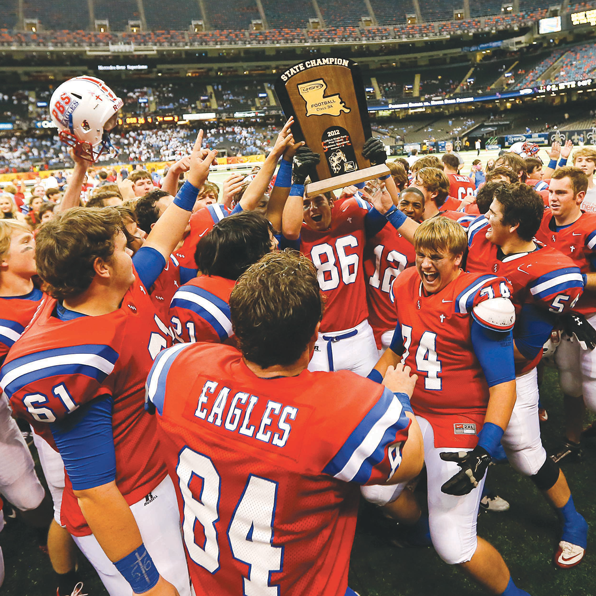 District champions and schools with high power point ratings compete in playoffs, culminating in five state championship games in the Superdome each December. Under the new system, both select and non-select schools will continue to compete is their existing districts. However, when the playoffs begin, the non-select schools will compete in the five existing categories — 1A, 2A, 3A, 4A, and 5A. But the select schools will compete in two completely separate playoffs. Division I will include 3A, 4A, and 5A schools, while Division II will include 1A and 2A schools. As a result, a “select” school such as 3A Parkview would have to compete in the playoffs with the much larger 5A Catholic High. Kenny Henderson, director of the LHSAA, said supporters of the new system feel many public schools don’t have a fair chance to make it to the Dome. They say the select schools have an advantage. Henderson said opponents of the new system want to be full-fledged members of the association and don’t want to be splintered off. On Tuesday, representatives of more than 60 private high schools from across the state met at Parkview Baptist to discuss how to address the new system. Guillot says it is still very difficult to fully understand how the new system would work because it is not clear which schools will be determined to be select schools. He noted that East Baton Rouge Parish Schools Supt. Bernard Taylor has been considering turning many of the parish’s public schools into magnet schools. “Would all of these schools become select schools?” Guillot asked. LHSAA director Kenny Henderson said he expects to meet with many of the select schools Feb. 20 to discuss how their playoff system will proceed. He said the only way the decision could be reversed is if a special meeting of the principals were called. A special meeting could be called by LHSAA president Todd Guice of Ouachita High School in Monroe or by petition of 50 percent of the principals.